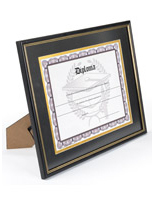 Graduates of high school, training programs, and college love our extensive selection of graduation-themed picture frames. Each display features a place for either a portrait of the graduate or the graduation certficate itself. Some models even feature a tassel holder for those that wear a cap and gown during the ceremony. 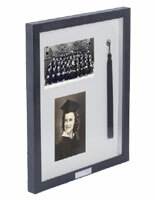 Other frame selections actually have an inscribed "graduation" message that clearly states the purpose of the display. No matter which style is chosen, the framing will give the user a feeling of accomplishment that can be shared with family and friends. Where are these types of themed frames generally displayed? Although most people tend to put up their graduation portraits and diplomas in their homes, many people at other locations have the need to show that they have received certain certification. 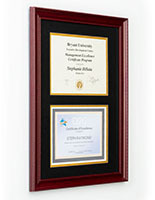 Doctors' offices commonly have some type of diploma documenting each staff member's specialty or area of expertise. Accountants and law offices often do the same thing with their special documents. No matter where these graduate-themed frames are hung, they are sure to get the attention of visitors. Don't leave patients, clients, or even family members in the dark about your accomplishments. 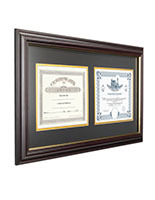 Let everyone know by hanging up one of these unique and practical diploma displays.